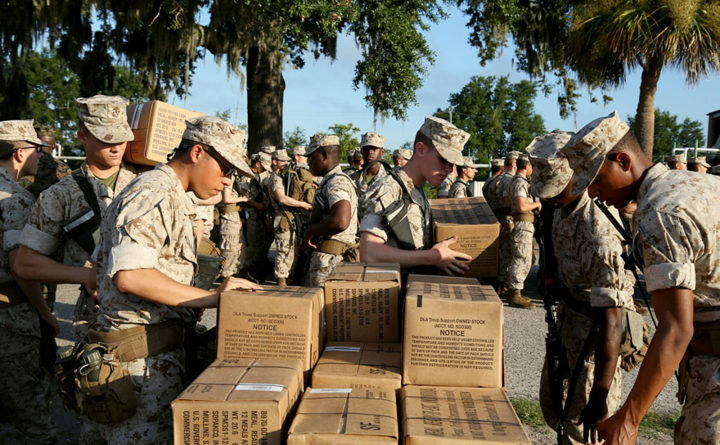 In this photo released by the U.S. Marine Corps, recruits at Marine Corps Recruit Depot Parris Island, South Carolina, prepare to evacuate to Marine Corps Logistic Base Albany following an evacuation order directed by Brig. Gen. James Glynn, the depot's commanding general Tuesday. All Marines at the depot who are currently in recruit training will be transported to the base in Georgia. NORFOLK, Virginia — The Navy is moving people and ships ahead of Hurricane Florence, and the Air Force and Army are both flying advanced aircraft elsewhere as a safeguard. Some remaining Marines, meanwhile, are digging in their heels. Nonessential personnel were released from duty at Lejeune and told they were free to relocate with their families to a site within a 500-mile radius of Jacksonville.